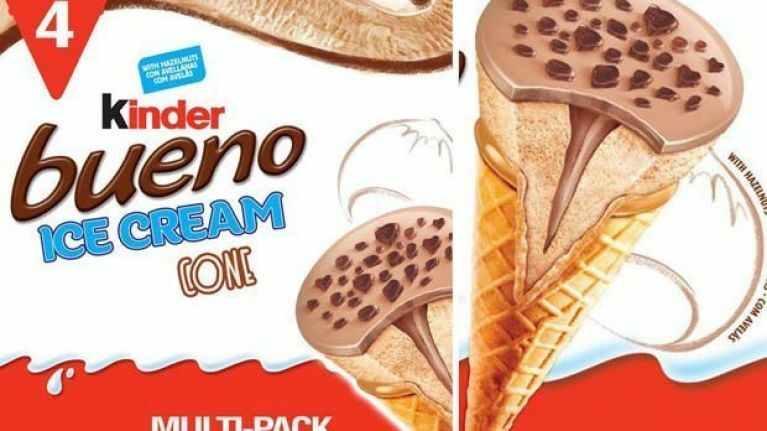 Hark the herald angels sing: "Glory to the new born King... which in this metaphor is the Kinder Bueno which is finally available in the UK in ice cream form". Or something, I don't know. It's big news basically. The Kinder Bueno ice cream has been around for a year, but only in Europe. Until now. According to Instafoodietwins, as good a source as any on popular chocolate bars turned ice creams, they cost £4 at Asda and are available on Ocado for £3.50. The Bueno cones are made with creamy hazelnut ice cream and topped with a hazelnut disk and chocolate pieces. If that wasn't enough, there's milk chocolate sauce in the middle. The Kinder Ice Cream Stick, meanwhile, is ice cream coated in Kinder chocolate on, you guessed it, a stick. If you need me to explain what the Kinder Ice Cream Sandwich then these products just aren't for you I'm afraid. So there you have it. Now spread the word, buy Asda out of ice creams, full up your freezer exclusively with Kinder Buenos, put your feet up and wait for the long, harsh Brexit winter to eventually consume us all.